Day Six: U.S. F-22 Pilot Becomes First Ace of New Korean War. Major Henry “Schadow” Schantz was an F-22 Raptor test and demonstration pilot prior to the sequester that grounded his Raptor Flight Demonstration Team. 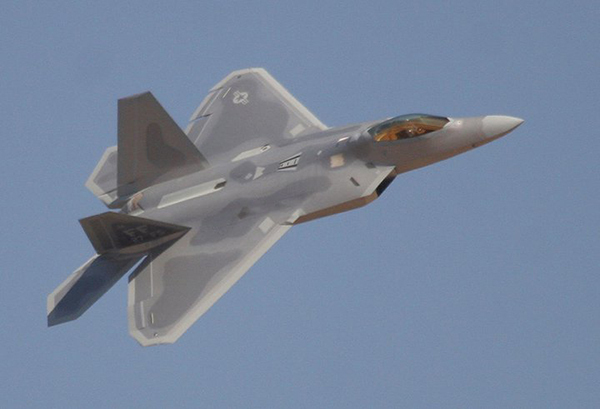 His F-22 Demonstrations thrilled air show crowds before congress pulled the plug on the funding. He was a classic fighter pilot, a stick and throttle man skilled at aerobatics and the lethal dance of aerial combat. He was also a virtuoso with the weapons systems of the F-22 Raptor. Schantz was TDY (temporary duty) as a weapons and air combat instructor with the Air National Guard F-22 drivers at Joint Base Elmendorf-Richardson in Alaska when the Korean Crisis began. He, along with the rest of the 477th Fighter Group, flew their Raptors over 3,600 miles to Japan wearing four big 600-gallon under wing fuel tanks on BRU-47/A external pylons. Once they landed at Yokota AFB west of Tokyo in Fussa, maintenance crews removed the tanks and pylons, restoring the Raptors’ low observability and uncluttered appearance. Then crews loaded the “Air Superiority” package on board. The Raptors became clean and naked on the outside for maximum stealth and performance. They carried a lethal internal load-out of six AIM-120C air-to-air missiles and two advanced AIM-9X all-aspect, infra-red air-to-air missiles. They also packed a holster of gun powder and lead in the form of 480 rounds of 20mm incendiary and armor-piercing cannon shells for their M-61 Vulcan cannons that spit shells at a withering 6,600 rounds per minute. North Korea has a large air force for a country of its size. While most of it is relatively antiquated what it lacks in sophistication is compensated for by size. 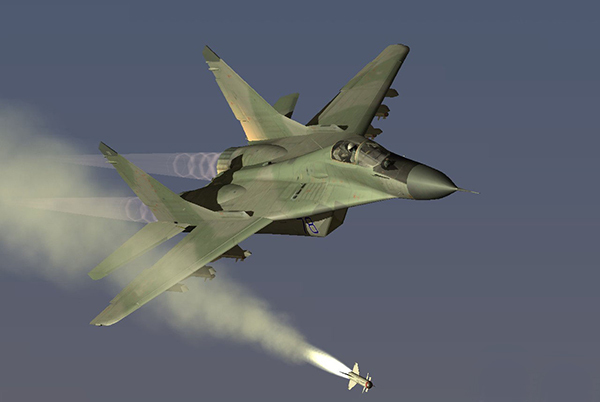 The primary concern over the North Korean battlespace was their MiG-29 Fulcrums. Maj. Schantz was sent to Guam to take care of those Fulcrums. The Fulcrum is a worthy opponent with incredible thrust to weight from its burly, twin Klimov (formerly Tumansky) RD-33 turbofans that can belch 37,000 pounds of wet thrust. It uses an impressive Phazotron RLPK-29 radar sensor and fire control system with the ability to track ten targets simultaneously. In good conditions its radar can track other fighters up to 70 miles from the front quadrant of the aircraft, larger targets, like an American B-52, even farther. The bulbous IRST or “Infra-Red Search and Track” ball on its nose was an effective close range, stealthy sensor. Fulcrum drivers wore a unique helmet mounted sight that provided limited off-angle target acquisition. The MiG-29 is a robust fighter, with heavy covers that flop down over its intakes when taxing to prevent objects from being sucked into the intakes when operating from unimproved fields like a dirt airstrip or a roadway in time of war. It can be started with small explosive cartridges to rotate its turbines and does not need an APU cart. Even the landing gear looks like something from an off-road vehicle compared to squat legs of the F-22 that look decidedly delicate and ungainly on the ground. Schadow Schantz and his wingman were back in the air only twelve hours after landing in Japan. As the sun rose the next day the pair were briefed and took off on a CAP (Combat Air Patrol) mission over North Korea. Climbing out of Yokota the pair immediately formated into a wide line-abreast to make maximum use of their net-centric AN/APG-77 Active Electronically Scanned Array radars. Since the F-22 is a low-observable or “stealth” aircraft the APG-77 radar is also stealthy, with a rapid interrogating, narrow beam scanning capability that makes it difficult to back track. Schadow’s tactics made best use of the F-22’s capabilities; find targets before they found him and engage them before they knew what hit them. The APG-77 quickly picked up what looked like a beehive of North Korean air activity. Friendly air activity was marked by identification friend or foe (IFF) transponders on Schadow’s data screen in the F-22 cockpit. Targeting computers prioritized contacts and assessed range to target. When Schadow closed to within 80 miles of the first lock-up the computer gave him the option: TARGET:FIRE. He touched a button and the doors on the side of the Raptor flipped open like a gunslinger sweeping back his trench coat to draw. The launch rails expelled one AIM-120 AMRAAM and its engine lit as it tracked off, nearly straight, accelerating to Mach 4 on the way to target one. Only seconds after the first AIM-120 launch Schadow got another launch indication and selected “FIRE”. His first missile was still on the way to its target when the second left its launch rail. Less than one minute later four targets had been designated, prioritized and launched against with AIM-120’s. Schadow’s rate of closure had him to within 40 miles of the outer ring of contacts. He had Sidewinders and cannon shells left, and plenty of targets. His sensors and local AWACs aircraft indicated that, miraculously, all four AIM-120’s had found home. In less than two minutes Schadow bagged two MiG-19’s, one prized MiG-29 and a lumbering tactical transport aircraft that was unlucky enough to stumble into the target designation screen of Schadow’s Raptor. He hadn’t even moved his control stick and he was one kill from becoming the first or second ace of the New Korean war. The first man to bag the next confirmed kill would have that distinction. Schantz increased altitude and power, advancing his throttles to “supercruise” range and breaking the sound barrier without any afterburner. It only took gentle pressure on the stick to initiate an efficient climb attitude. With the sensor suite slewed to his remaining weapons package he needed to get close enough for an infra-red target acquisition to use his two AIM-9X’s. The ghost grey F-22 vaulted upward on its louvered, vectored thrust tail. It shot through a low, widely dispersed wispy cloud deck at 35,000 feet and kept arching upward as fast as a rifle bullet. Tearing through 40,000 feet Schantz saw his displays dance and blink with targets. None had detected him yet. His MFD’s signaled target “acqs” for his AIM-9X’s and he began a wide, arching turn while leveling out at 50,000 feet, then he pushed forward and levitated against his seat harness as he went negative G beginning his dive to engage a pair of MiG-29’s below. Schantz locked-up the first MiG-29 with a good tone and launched one Sidewinder. The range was closing fast and he worked quickly to gain another solution on the second MiG. Flares popping out from the first MiG and what must have been a gut-wrenching, speed-sapping high-G turn by the MiG signaled that the battle had been joined. Schadow Schantz made the transition from long-range sniper to street fighter. The second MiG rolled left and broke, popping a trail of glowing flares while he let his turn out to not bleed off too much speed. In response Schantz traded altitude for airspeed for another two seconds, overshot, knew his first Sidewinder had somehow missed, cranked a full roll right reversing left after the second MiG. His cockpit lit with missile warning lights as the first MiG snapped off an R-27R missile, a dangerous and maneuverable dog-fighting missile. The sky was full of contacts now. Schantz’s wingman was similarly engaged about 10 miles north, alternately bringing the fight to, and trying to evade another pair of MiGs. As other U.S. and North Korean aircraft entered the battlespace a series of “furball” dogfights began, with heat seeking missiles and now, the occasional ripping sound of air-to-air cannon fire filling the sky from 2,000 feet up to 35,000 feet. The greatest aerial battle of the modern era and the biggest since WWII had just begun. Schantz’s automated countermeasures suite launched flares and anti-radar countermeasures as he realized he was a little hot and executed a pull-up to scissors to gain position on the second MiG. He instantly got a good tone and launched, the wide aspect Sidewinder seemingly defying physics as it dove into an impossible arc following the second MiG. Schantz realized the threat of the first MiG, the one he missed, at the same time his missile launch indicators lit up. The first ’29 had gotten in position for a good launch and Schantz was in trouble. During the annual Red Flag fighter combat simulation exercise in Alaska, 2011, a number of Luftwaffe Typhoon pilots discovered that, if you get the F-22 into a low and slow engagement, it is no longer the clear winner. When dissimilar aircraft crossed sabers with the Raptor in a close-range dogfight the Raptor was just another jet with guns and missiles. It was no longer invisible, wasn’t much faster, couldn’t really turn much tighter and didn’t have a weapons advantage. It became just another fighter plane. In those circumstances, it became a contest between pilots. A dogfight. An R-27R missile is a deadly and maneuverable adversary. It can pull incredible G and is more maneuverable than any of the aircraft it is targeting. The one thing it lacks is a brain. And airshow experience. Maj. Schantz was accustomed to flying his airshow flight demonstrations inside what is called the “aerobatic box”, a small cubic section of air space authorized for aerobatic competitions and demonstrations. As a result he had an extra repertoire of maneuvers not commonly needed in air combat school. One maneuver he used to reposition his aircraft and keep the demonstration in front of the crowd line. It was a variation of the famous Pugachev’s Cobra, a maneuver long since dismissed as strictly an airshow stunt with no tactical value. Basically, a Cobra maneuver laid on its side, this maneuver accomplished the critical tactic of “beaming” to defeat an air-to-air missile, or turning the aircraft violently to put the missile at your 3 or 9 o’clock. It also sucked airspeed, forcing the F-22 well below its “Vs” or stall speed. 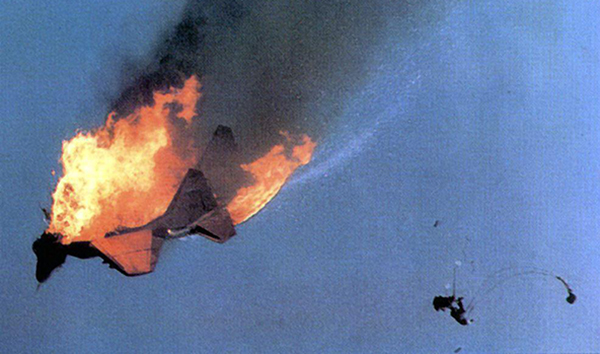 Depending on how fast (or slow) Schantz’s F-22 was going when he entered the maneuver the result would be that his aircraft would simply drop out of the sky. Schantz knew his sophisticated fly-by-wire flight control system would protest such a maneuver, but he knew how to “cheat” the raptor by skidding it in the air, a sideways cobra, speed bleeding below Vs and his aircraft falling vertically out of the sky. The manipulation of pedals and stick was in utter contradiction to the software that managed the flight controls, but inertia and physics won out. and so did Schadow’s barnstorming skills. As the missile sheeted toward him with frightening speed his aircraft seemed to roll on its side, stop dead, and drop out of the sky like a broken toy. The missile over shot. This stunt hit the reset button on the engagement. Schantz was now without airspeed and losing altitude, two things an aviator can never get enough of. In utter contradiction to what any non-aviator would do, he centered his stick, pressed it forward and added power. Altitude: 3,200 ft. AGL. Airspeed came up rapidly, 1,900 ft. AGL. Enough air was moving over his control surfaces that the plane began to fly again. Airspeed 180 knots, altitude 1,200 ft. AGL. It took more than a measure of nerve to watch the ground coming at him- and do nothing. 235 knots, 800 feet above the very hard ground. Alarms blaring. The F-22 is 62 feet long. Schadow couldn’t remember where that was measured from on the aircraft. He hoped it was the nose. 600 feet. He gently edged the stick back and felt the reassuring weight of G force as his G-suit inflated and the nose started to walk upward over the terrain to the horizon. By 250 feet the aircraft was nearly level, by 150 feet it had assumed horizontal flight and was at 250 knots and accelerating. Schantz juiced the throttle and pulled back, grabbing one quick look at his tactical situation display. A target was approaching from his 5 O’clock, about 1,500 feet above. He poured on the speed as the Raptor stood on its tail, got missile tone and fired his last AIM-9X. It missed. Over the top Schantz pulled back hard, rolled inverted, got tally ho on the MiG-29 he just barely missed and pulled his stick back. The MiG must have been low on fuel since it appeared to be running. The “GUN” piper came up, an LED circle that predicted the path of his cannon shells. Schantz touched the trigger. There was a brief ripping sound and an unexpected belch of trailing smoke as the cannon spun up and loosed a line of 20mm shells. The MiG flew right through them. Nothing seemed to happen at first but then a brief tongue of flame exited the right engine and the aircraft rolled right. It occurred to Schadow that the MiG-29 is not a “fly by wire” aircraft and relies on a more primitive mechanical and hydraulic flight control linkage. More primitive, and more vulnerable to cannon shells punching holes in the aircraft. The MiG continued its right roll, settling into a dead engine, then began to pitch up to high alpha, a deadly combination from which there was no recovery at this altitude with a dead engine. The pilot did the smart thing and grabbed the handles. His K-36 ejection seat blasted upward, deploying a pair of stabilizing drogues, and he separated from the seat, his parachute beginning to deploy. The crippled, bullet riddled MiG skidded sideways in the air and dropped, a decidedly inelegant death for such a graceful plane. Schantz saw the Korean pilot under his parachute, descending toward open fields. He looked like he tolerated the ejection well, his arms up and trying to steer the parachute. He flew one wide slow circle around the pilot. The chivalry of airmen transcended the horror of war. Schantz rocked his wings and the surprised Korean pilot watched in surprise as the Raptor stood on its tail again and accelerated vertically. USAF Major Henry Schantz, call sign “Schadow”, became the first combat pilot to score five confirmed kills, all in one sortie, in the new Korean Conflict making him the first ace of the war. That same day two more Raptor pilots would join the elite fraternity. Later that week a Marine pilot in an F-18 and two USAF F-16 pilots would also score their fifth aerial victories and become aces. In North Korea it seemed to be raining MiGs. U.S. Air Strikes on North Korea.